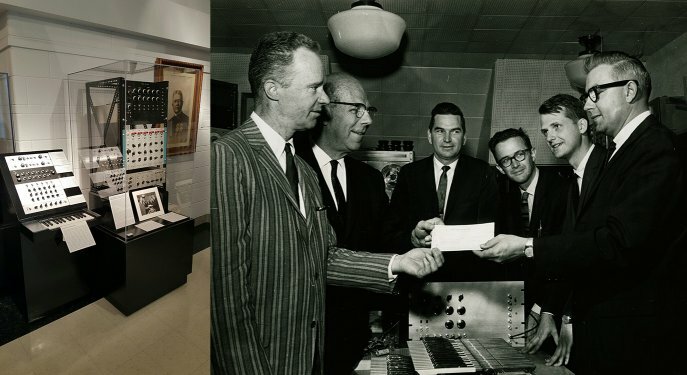 Left to right: Duane Branigan, Director of the School of Music; William Everitt, Dean of the College of Engineering; James T. Smith, director of Urbana Government Operations for the Magnavox Company; Prof. L. A. Hiller of the School of Music; James Beauchamp, graduate student conducting research under Hiller's direction; and George A. Schupp, director of engineering for Magnavox. In the early 1960s, Dr. James Beauchamp from the University of Illinois developed the Harmonic Tone Generator, an additive synthesizer that allowed the user to build up a sound from 6 sine waves precisely tuned to the harmonic series. At the time, this was very difficult to do electronically, and Beauchamp figured out how to do it by heterodyning signals up to ultrasonic frequency (like in an AM radio). Another interesting thing about it was that each harmonic had a separate envelope to control its loudness over time, and the user could add a delay time between when the note was played and when the sine wave started its envelope. 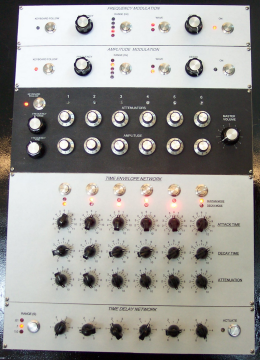 This allowed for interesting timbre changes that were not possible on other synthesizers at the time. 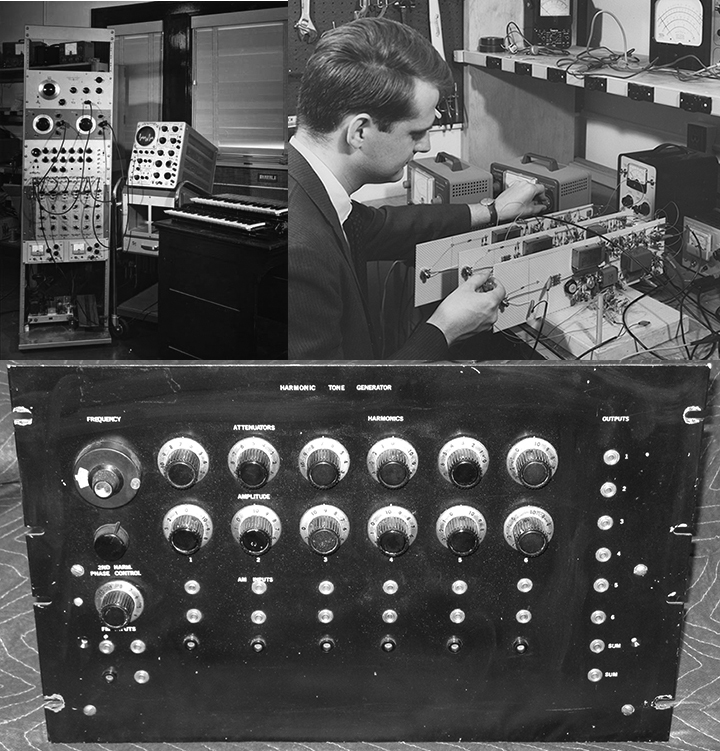 In 2015, Jim donated the original hardware to the Sousa Archives at the University of Illinois. It no longer works and would be very difficult to repair because of the unavailability of parts. I worked with Jim and Scott Schwartz from the Sousa museum to build an emulator that could be played by museum visitors to show how the original worked. It is now housed at the museum. 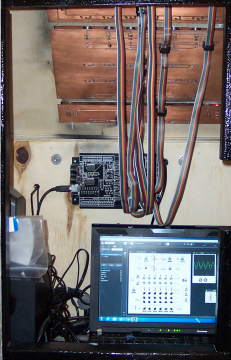 Here is an article about the project on the ECE Illinois page. The emulator consisted of a laptop computer running Native Instruments' Reaktor software, connected via USB to an Alesis Q25 mini keyboard and a Livid Brain 2 MIDI board. These were mounted inside a wood cabinet constructed by Sousa Archives Director Scott Schwartz. Hear the HTG emulator in action! 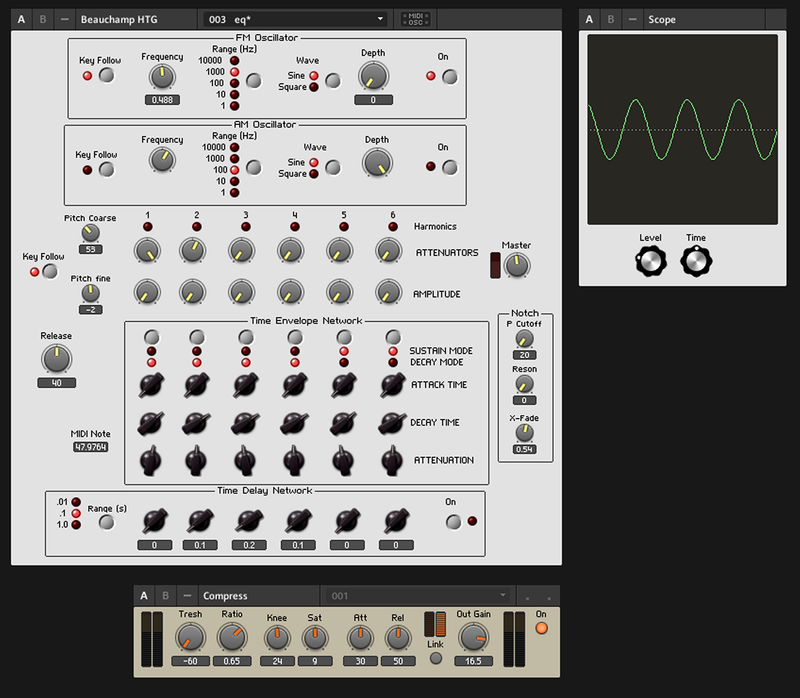 Here are images of the panel and structure of the Reaktor ensemble I designed. The Brain scans the buttons and pots and sends MIDI data (Continuous Controller messages) to Reaktor when the controls are moved. 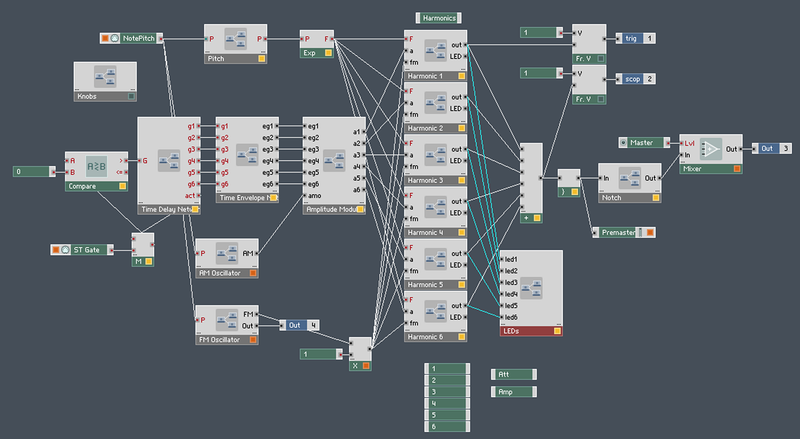 Then Reaktor sends MIDI back to the brain board to tell it when to turn the LEDs on and off. In order to make the HTG more child-proof, the slide switches on the original have been replaced by pushbuttons which toggle LEDs to indicate the present state. I will post a couple of videos at some point. 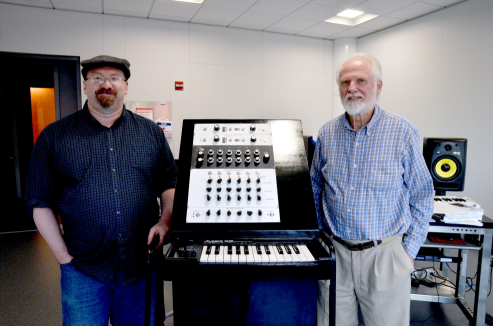 On November 11th, 2015 Jim and I gave a talk at the Sousa Archives about the project. Here is a page about it posted by Skot Wiedmann. Illinois Public Media did an article and radio story about the project. .